Yesterday was busy and left me tired, but it was very fulfilling. The Pulmonary Hypertension Support Group that I lead covers the whole state, but distance prevents many of the patients in the southeastern corner from attending the meetings held in the center of the state. 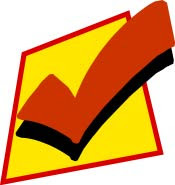 Several months ago, I began planning yesterday's meeting, and if the attendance at the meeting is any indication of the need, then I am glad that I did. 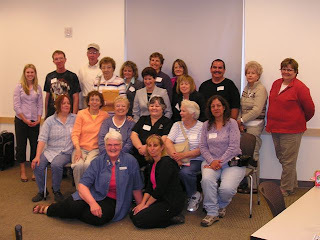 Many of the nine Cheyenne PH patients hadn't met previously, so in that respect, the meeting was a success. In addition to that, the program provided them with the latest information on Pulmonary Hypertension and its treatments. Everyone left with an full stomach, a packet of goodies, some new friends, and some helpful information. I consider that a successful day. A friend recently gave me The Quilt by T. Davis Bunn as a belated birthday gift, and yesterday afternoon while I waited for new maps to download on my Garmin, I read it. It is a quick read and a delightful story. It has a powerful message: to glorify God in all that we do and to give thanks for everything in our lives. At one point a reference is made to George Matheson. I did not recognize the name until I did some research. 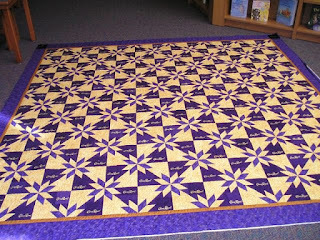 The Quilt cited Matheson's "Thanks for the Thorn" to illustrate our need to praise and thank God. I have never thanked thee for my thorn. But never once for my thorn. Teach me the value of my thorn. Show me that my tears have made my rainbows. Today, I pray that you see the rainbows in your tears. A small bit of yarn (too small to be of use) remains from a wool, thrift-shop sweater. 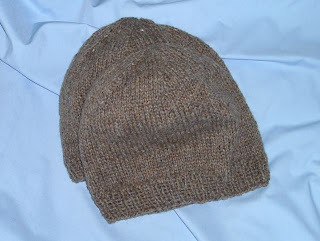 The sweater's yarn was used to make two helmet liners, one neck gator, and six hats. All were made for the troops. Heavenly Father, we cannot adequately express our gratitude to our military men and women whose selfless service and sacrifice continue to provide safety and security to our Nation. We can, however, ask for Your divine protection as they face adversity in places of conflict. Lord God, protect these men and women from all harm and danger. Guard their families from worry, fear, and anxiety in times of separation. 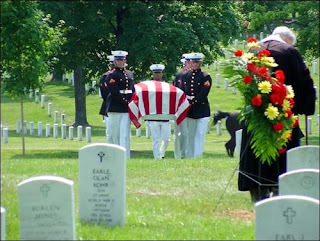 Eternal God, as veterans return to their homes, many bear physical, emotional, and spiritual wounds and scars. We ask You for special care and healing for these, Your servants. Gracious Lord, grant wisdom, strength, and courage to our chaplains as they serve in the Army, Navy, Air Force, Marines, Coast Guard. For our Veteran's Administration Hospital chaplain, we ask You to grant patience and determination as they seek to care for the sick and injured. O God, throughout our nation's history, we have relied on Your divine protection. The faces of those who have worn our nation's uniform have changed; yet, their mission, their purpose, and their sense of duty remain unchanged. Let Your changeless Gospel shine in the dark corners of our world that peace may prevail, through Your Son, Jesus Christ, our Lord, who lives and rules with You and the Holy Spirit, one God, now and forever. 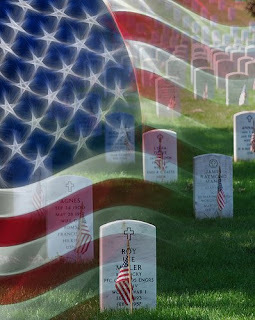 All gave some; some gave all. My sister gave me a kit for a Bear Paw quilt several years ago after I purchased a new sewing machine. This week Marilyn (my sister) found the kit stuffed in a drawer and encouraged me to begin working on it. 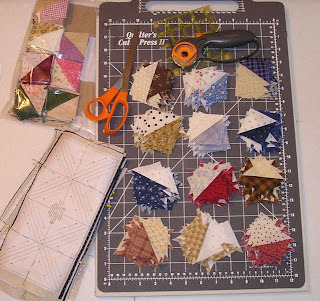 We both cut and prepared the fabric for half-square triangles (HSTs). 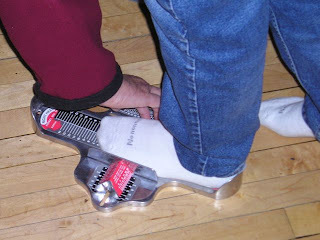 Years ago, I purchased a roll of Thangles, so we used them to make the HSTs more accurate. Thangles are paper marked with sewing and cutting lines (shown in the lower left in the photo). I made a lot of progress on the HSTs, but I still have a lot more to sew, press, and trim. My sister and her husband spent Tuesday through Friday at my house, and we had a lot of fun - visiting, eating out, gambling, and quilting. 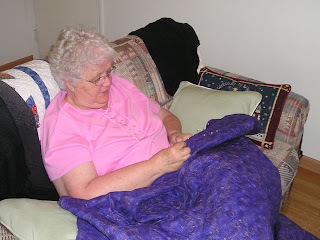 A local long-arm quilter had Marilyn's Crown Royal quilt ready, so Marilyn spent the evenings tacking the binding while watching the Denver Nuggets and Los Angeles Lakers play in the NBA playoffs. The photo, taken before the binding was completely tacked down, gives you some idea of how stunning this quilt really is. 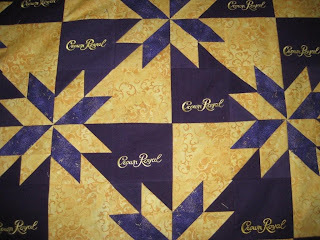 She used 156 Crown Royal bags (the bags make up one of the arrows in the Hunter's Star pattern) that a friend of her husband had collected. 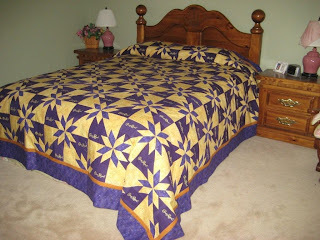 The man commissioned Marilyn to make the King-sized quilt. 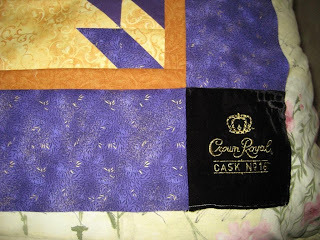 The black blocks in the corner are also Crown Royal bags, but they are velvet. Update: I've had several people ask questions about the quilt, so I asked my sister to provide specific information about how she made it. Here is what she said, "The CR block is 8 inches finished. 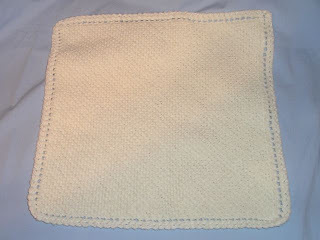 The square that has the CR name is 4 inches finished. When cutting the square with the CR if I couldn’t get a 4 ½ in square, I sewed a piece on to make it 4 ½ in square. I had 5 different sized bags when I started so some I couldn’t get the 4 ½ in square so that is why I added. There are four 2-inch finished HST in each 8 inch finished block and one 4-inch finished background square. It is the Hunter Star pattern, but I used HST triangles instead of the original Hunter Star Pattern. I used two fabrics plus fabric in the bag. Hope this helps." 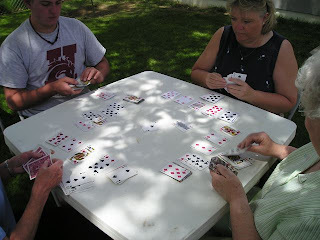 When my family gathers, it is common to gather multiple decks of cards, clear off a table, and challenge others to play Nerts. We had up to six people playing at one time this weekend, but other gatherings have been known to have eight - twelve players. It can get pretty wild and intense, but it is always a lot of fun. Warning: your cards may be bent during the game, but the fun they provide is priceless. Saturday and Sunday part of my family gathered to attend the commencement of my great-niece who was graduating from high school. We ate, we visited, and we rejoiced. 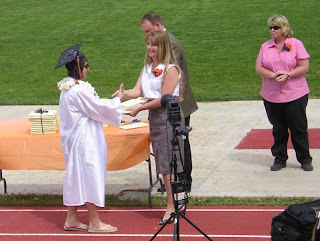 My sister and her husband were pretty proud of their only grand-daughter's accomplishment. It is hard to believe that I am managing to stay on schedule for the Block of the Month Sampler. This month's blocks (lower right) are Swing in the Center and Churn Dash. 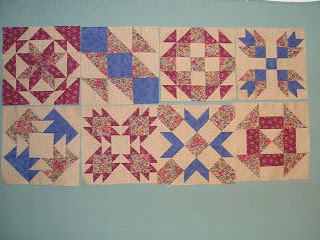 Even with all of my mistakes, I am beginning to like the way quilt top is taking shape. 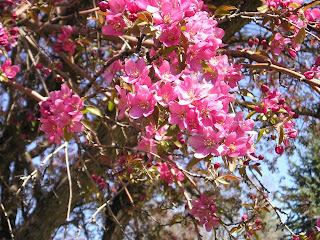 Many homes in this area have crab apple trees, and they are putting on a nice show this year. Soon the lilacs will be blooming, too, and will bring sniffles and tears for those with allergies. Their fragrance will envelope the town, especially at night, creating sweet dreams. Sadly, both floral displays are short-lived, and their petals will fly like confetti on the wind. 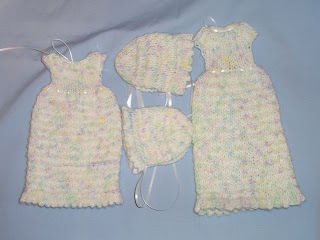 These two Bereavement Gowns (micro preemie and preemie size) & bonnets are for the All Crafts for Charity project for the month of May. I used this pattern. Layettes will be prepared from the items donated and then presented to the Oasis of Hope - Babyland Shelby County Medical Center. You can read about the Center and the Oasis of Hope program here. I also made a preemie blanket for the project. 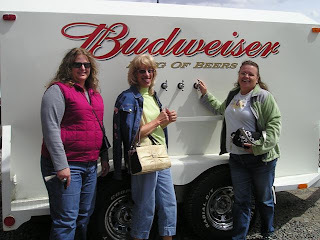 Saturday, I joined three gals from my knitting group for a road trip. We jumped in Jane's new car and headed for the High Country (Dubois) to do some shopping and to eat lunch. I don't think I have laughed so much in a long, long time. The trip was a blast. 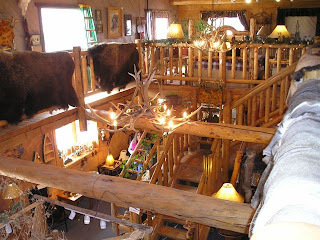 We wandered though all the shops and stopped in Absoroka gifts to pet the pelts (fox, coyote, bison, deer, elk, Highlander, etc) and sit in the handmade lodge pine chairs. Isn't that antler chandelier beautiful? 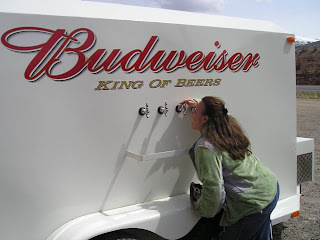 This beer wagon was parked in front of one shop, but sadly was not operational. The town is preparing for a festival next weekend. Jane, Nancy, and Trish took advantage of the opportunity to be photographed with a "King." Trish even mugged for the camera! Everyone, but me, left the store with at least one pair of shoes. Over a delicious lunch we discussed the latest Survivor series, with everyone sharing their impressions of Coach. After a shared dessert, we headed out for more adventures. I cannot remember when I have enjoyed myself so much. I hope we have more road trips in the future. 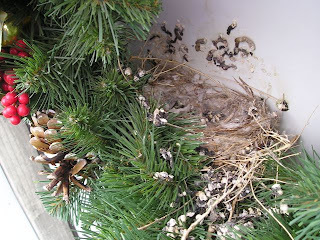 I was a bit disappointed to discover that the little ones have flown the nest. That is until I saw this later in the day. . . 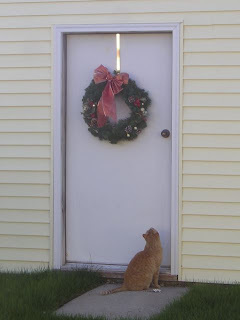 The neighbor's cat had a bit too much curiosity about the nest. I have no doubt that if the babies had been in the nest, she would have found a way to get to them. I watched the cat for about 15 minutes and took these photos through a window crusted with winter grime. 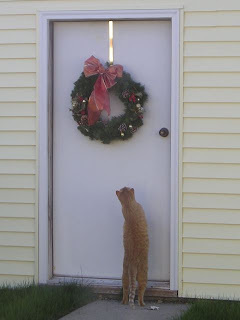 The cat stretched, sniffed, and tried to bat at the wreath, but just could not reach it. However, if the babies had been in the nest, I definitely would have intervened. 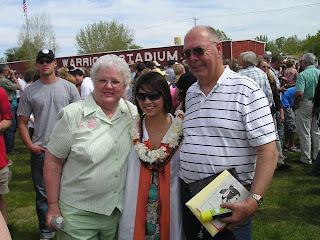 ". . .I want to tell you something about our church at Saint Stephens. I talk often about it. I know how it started. I was baptized by the priests who came to start the mission. . .We gave the land of our own to them to put up a school for our children. 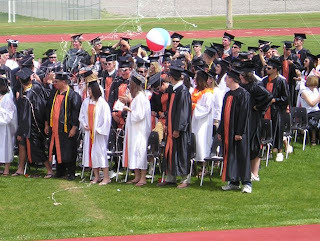 We sent our children to that school because they took good care of them. All learned to talk English. All learn to speak about God. We see them. How they pray in Church. And they also learn to pray in our own language. 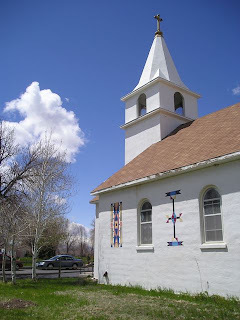 We feel good about that. . "
The Saint Stephens Indian Mission was founded in 1884 when Father John Jutz offered Mass at Chief Black Coal's camp, which had been located along the banks of the Little Wind River. The original site had been near the confluence of the Little and Big Wind Rivers, south of Riverton. 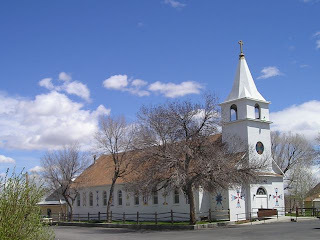 Since the original site was far too sandy and was prone to yearly flooding 1886, the Mission was moved to its current location (St. Stephens) which is on the Wind River Indian Reservation. The Reservation is home to two tribes: the Arapahoe and the Shoshone. The original church building, as well as the boy's dormitory, was destroyed in a devastating fire on January 20, 1928. The church was completely rebuilt and finished in time for the Midnight Mass on Christmas Eve of 1928. The church as undergone a number of face lifts, the latest and on-going renovations began the summer of 1995. 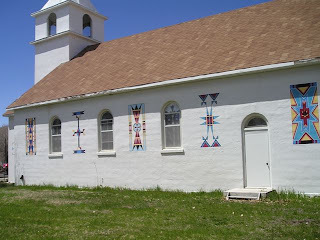 The exterior of the church is decorated with Arapaho symbols, each repeated on both sides of the building. These symbols represent the world around us, each with a specific meaning. It was impossible to get good photos of the stained glass windows, but they can be seen here. I think parts of the windows would make wonderful quilt blocks. 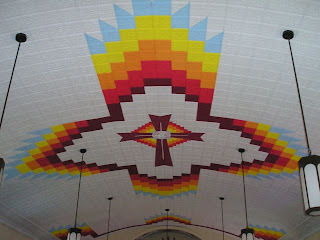 The Cross at the center of the ceiling artwork is formed by the joining of four duplicates of an Arapaho symbol for a person. The base of each design is standing at the four directions of the earth. The white line running through the center of each of the person-symbols or branch of the cross symbolizes that Christ should be our center and the guiding force in our lives. The fact that each symbol is joined at its base, encircling the world, shows that we are all creations of God and should be united as such. 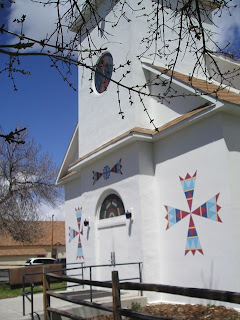 On each side of the Cross is a modified quilt design with mountain symbols representing the four directions. These designs are reaching out to show that the Word of God can reach anywhere and anyone. At the front and back of the ceiling design are cloud symbols reaching to the earth, much the same way that God is reaching out to us. The Baptismal Font and the Altar were constructed to resemble drums. During pow-wows, the drum called the people together, letting them know that the festivities were about to start. The People would come. The beat of the drum the heartbeat of the Indian People. That heartbeat has always done its best to stay in rhythm with Creation and the Creator. 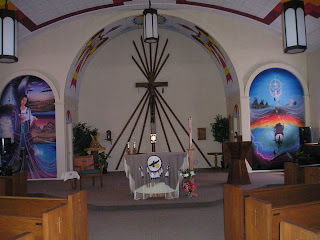 Behind the Altar are intersecting tipi poles. In the past, bare tipi poles left standing were an indication that the tribe or family had to pack and leave quickly, usually to escape some impending danger. The Crucified Christ hanging over the bare tipi poles symbolizes that no matter what calamity befalls us, Christ is always with us and will see us through the dark times in our lives as well as the good. To the left of the Altar is the Creation Mural which depicts the earth as an Indian maiden, rising out of the power of the universe. As a representation of the earth, she holds in her hands the beginning of life; the flora and fauna. Soaring behind the maiden is the eagle, representing the spirit of life. To the right of the Altar is the Resurrection Mural, depicting the spirit of humanity rising up after death. Lifted up out of the stormy waters of sin and darkness, the human spirit reaches up to the Creator. The power of the resurrection is symbolized by the dove emerging from the Spirit of God. 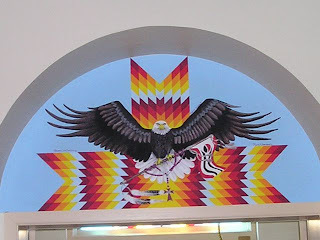 The path to Christ and heaven is depicted with the eagle feathers that humanity should follow to get to heaven's gate. Taken from the darkness of death, our spirits are greeted by our families, friends, and those who have gone before us. We will be welcomed into the Creator's Lodge, where we will know no want, need, or hunger. Above the exit door is another mural. Against the backdrop of a star quilt design, the eagle, along with the Arapaho Flag, a Rosary and feathers challenge us as we leave the Church, to live in peace with one another, to help those in need, and to walk humbly with God in our every day activities. Audio books make reading and knitting simultaneous activities, and I discovered a new option at the library: Play Away books. 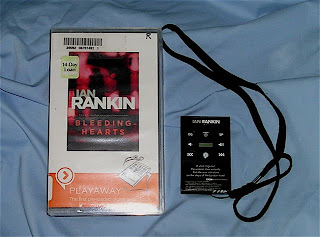 The books are preloaded on small mp3 players. I just needed to plug in my own headphones or portable speakers. I listened to Bleeding Hearts while working on the cropped cardigan and a baby blanket. I liked the convenience of the preloaded book, but I prefer to use my iPod Shuffle. The Play Away can be paused but turns itself off if left unattended. It did not resume where I left off when I turned it back on; thus, forcing me to search for the proper chapter. When its battery gets low, but not dead, the Play Away will suddenly stop. Despite the frustrations, these Play Away players would be great for someone who does not own their own mp3 player, or someone who does not have the capability to download their own books. One reclaimed wool sweater is finding a new purpose as hats, helmet liners, and a neck gator for the troops serving overseas. 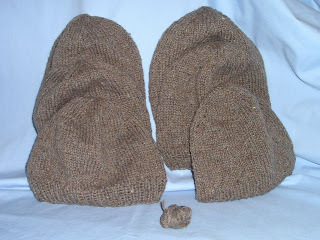 These two hats are for a hat drive at High Prairie Quilt Shop in Parker, Colorado. I hope to knit at least two more before the first of June. The pattern link is given on the shop website. I made the ribbing 1 1/2 inches long instead of the 3 row rib, given on the pattern. 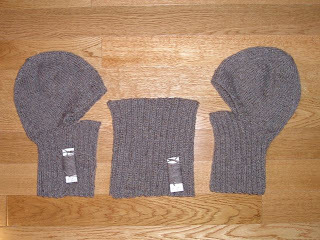 These three items were sent to the Citizen SAM project, based in Illinois. Scroll to the bottom of the Citizen SAM page for the gator and helmet liner patterns. These items will no doubt be subjected to rough conditions, so I attached some extra yarn to make necessary repairs. I pray that these items made from a thrift shop sweater will protect the soldiers from harm and bring them safely back to their families.